The 500 dollar project car... project. I have about $500 to spare, so I decided, why not get a POS project car? I already have a super reliable daily driver, my 99 ML320 with 208k miles. I've been trawling craigslist, looking for something with a stick, since I have a desire to row my own gears. My 500 dollar search led me to some horrible trash heaps. I was looking japanese, to change it up for a bit, but nothing there really piqued my interest. As most of my car searches end up, I started searching for old MBs. For some reason, I cannot just look at other cars, I have some sort of MB addiction. I even checked some BMWs, found a few project cars, but still, none of them gave me the "tingles". I did end up finding a car, which I'm in the process of setting up to see (hopefully tomorrow). 380SEC, White, 139k miles, 1982. Seller said that it has no title, but when I emailed, he said that he may be able to get the title. No title is a dealbreaker here so it really hinges on whether he finds the title or not. Craigslist ad said to "make an offer." I told him I had 500 dollars. The car is at a dismantlers I believe. Paint is faded, has some ricer- trispokes. But apart from that the car looks REALLY clean for something that ended up at the dismantlers. Gray interior doesn't have any big rips. The seller says that it turns on, but then dies after a bit. Fuel filter/pump? Battery? Alternator? 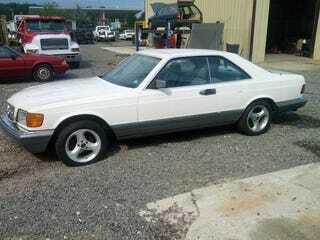 Who knows, but for $500, getting an 80's benz coupe with a 3.8 V8 is definitely up my alley. I didn't succeed on the manual part, but on this particular deal I am willing to sacrifice that. For this car, I plan COMPLETELY stock. Not a mod in sight, apart from the obligatory euro headlights and euro tweaks. I will update tomorrow with a report on the car when I go see it. Until then wish me luck that this guy finds the title.